Home > Distros > Fedora Review: Is It the Linux Distro for You? 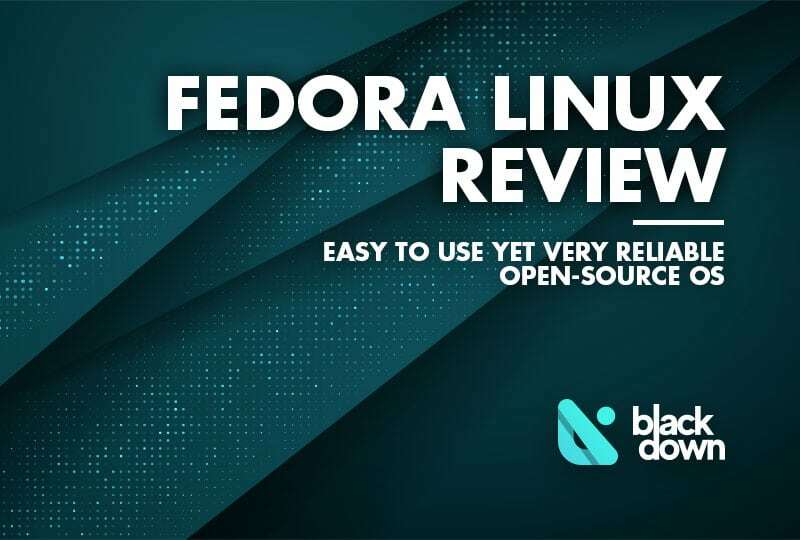 Fedora is often mentioned as one of the most popular Linux distros out there, which is reason enough to deserve a review article. Here is what you should know about this operating system, as well as detailed information on installing and using it. Fedora is an open-source operating system free for everyone to use. The developers emphasize that their main goal is to create an OS that will make things easy for the users, but be reliable and useful at the same time. The four principles that the community is centred around enters around include features, freedom, first, and friends. In other words, the developers care about making their content free while ensuring to create top-quality software. They also strive for innovation, which is why the community welcomes people willing to contribute and sharing the abovementioned values. Workstation – this operating system is suitable for both desktop and laptop computers, as well as novice users and developers. Server – it is a version that focuses on the modern data centre technologies, and allows the user to take control of all services and infrastructure. Atomic Host – an excellent choice for LDK (Linux-Docker-Kubernettes) application stack. It is worth mentioning that there is also a set of alternative downloads available so that advanced users can customize Fedora to their needs. In this article, we are focusing on the operating system and its features. At this moment, the latest OS version is Fedora Workstation 29. Before you can start installing Fedora, you need to download the operating system from the official website. It is nice to see that the site offers helpful documentation that will assist in the process of installation or at any point while using Fedora. Downloading the operating system is easy, and mounting it on a USB drive should be fairly simple, too. You will need free software, such as Rufus or UNetbootin, but the process shouldn’t take more than a couple of clicks and minutes. Even when you start the installing process of this Linux distro, things should remain pretty clear. You should only follow what it says on the screen, and you should be good to go. Before you can start using your new Linux distro, you will need to go through several additional settings. For starters, you will pick your language and keyboard layout. After that, the system will offer you to choose the preferred wireless connection. It will list the available ones, so go ahead and make your pick, but do not forget that you should confirm it with the security password if necessary. Once you finish the process, you will be taken to your desktop. As you will notice, Fedora uses GNOME as the desktop environment. It is a pretty common option for Linux distros, so everything looks the way you expected. At the top of the screen, you can see a search bar and an application list. Additional options include adjusting user, power, audio, and network settings. But since we are here to talk about Fedora, the best way to analyze this operating system is to take a look at the set of pre-installed tools. What Apps Come with Fedora? If we are honest, you do not get plenty of apps with Fedora, but the set of pre-installed software should be enough to get you started. The developers chose Firefox as the preferred web browser, as well as Evolution as the default e-mail client. You also have a text editor, as well as useful utilities like contacts, calendar, calculator, and file manager. When it comes to multimedia, Rhythmbox is the default audio player, and you can use GNOME Photo for basic photo editing and organizing your images. Cheese webcam viewer and Simple Scan, as well as the Boxes app for virtualization, are also present. If you want to install additional software on Fedora, you can do so with the default GNOME Software Manager. The crucial thing about is that it is graphical, which makes it newbie-friendly. That being said, keep in mind that the official repositories might not cover everything that you need. It is why you should consider installing unofficial repositories so that you can get all the software you require to enjoy this Linux distro the way it is meant to be. One of the things that you should pay attention to is the fact that you will need to install audio and video codecs to enjoy watching movies and listening to songs. The chances are your software will work like a charm, but if it doesn’t, you may want to consider reporting a bug to the community. While the updates are not as fast as for some other Linux-based operating system, the developers will probably resolve the issue in the shortest possible timeframe. When it comes to setting peripherals like printers and scanners, the installation should go flawlessly. Ultimately, it is hard to form an impression of Fedora. It is a reliable and stable Linux distro that won’t let down beginners or fairly advanced users. The installation process is simple, and the pre-set apps are more than enough to get started. The reason why we can’t put the finger on Fedora is that its workstation version is solid and nothing more. Due to the Gnome desktop environment, it reminds of Ubuntu, but it is a bit more prone to issues, especially with the software. Additionally, you will probably have to install some extra codecs and repository in the software manager to get all the apps you might need. If we discuss Fedora as an operating system, it can be an adequate place to start your Linux career. It is stable, secure, and fairly user-friendly – you can’t ask much more from a Linux distro. However, the real power of Fedora lies in its Server and Atomic Host versions. Although we didn’t review them in particular, if you are an expert user, they are worth taking into consideration.